I have one of the older Orion Atlas EQ-G mounts. Lately the scope has stopped slewing and shut down at random. I believe (with the help of previous forum discussions) that I have narrowed it down to a loosening or twisting of the 12v barrel connector during slews. This seems to be a fairly common scenario. It's my understanding that the newer mounts have a screw down connector for this very purpose. Right now I have electrical tape wrapped around the mount to secure the plug in place... total hack job. Anyone have any ideas or success in a more elegant solution to hold that connector in place? 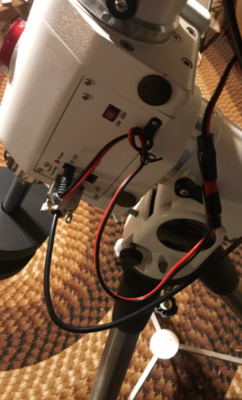 on the celestron cg5's, the panel mount connector has a split center pin. often, I need to take a small pocket knife or very small screwdriver and insert it into the split to make the O.D. of the pin slightly bigger. this works for a while to keep the connector from falling out during slews. generally once a season. not sure if the atlas mount is the same, but if it is, just open up the pin slightly. I use a nylon cable clamp secured by one of the screws on the power panel to provide strain relief. 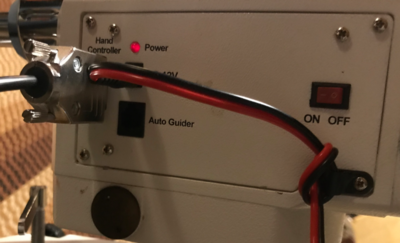 I replaced my 12v power cord with one that has a right angle connector, as it seems to create less stress on the plug. A wider view for more context...I use Anderson Power Poles to make disconnecting easy for transport. I also unplug from the mount during transport as well. Unfortunately the Atlas connector is just a standard metal barrel. I appreciate the response, though, and will keep this in mind should I come across a similar situation. Thank you very much for this... that's a great idea. I bet I could find a few more uses for cable clamps considering the current state of my cord management is... less than optimal. I am actually using a right angle plug right now but it seems to still be working its way out or otherwise losing contact. Mine may require a combination of cable clamps and something to hold forward pressure at the connection. At the very least this will let me get by with less tape! Edited by Jbslus2, 18 March 2019 - 03:57 PM. I purchased some decorator velcro (only one side is sticky), stuck a piece to the top of the mount and use a piece of the non-sticky to make an attach point for a loop of power cable. This relieves all strain on the plug.